The importance of energy efficiency is becoming less of an idea for tomorrow and more of a necessity for today. Globally, offices, living spaces and even shopping centers are taking on the challenge of the eco-friendly attitude in architecture. The Edge, The Kensington and Burwood Brickworks stand at the forefront of this green design trend. For some offices, transitioning to a green system can be as simple as ditching styrofoam for biodegradable cups. 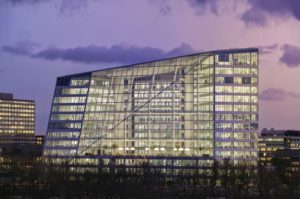 The Edge in Amsterdam, however, is not just some office. The Edge relies heavily on community in order to maximize its use of space. The office’s design trades traditional cubicles for a wide-open layout. Professionals in this innovative space enjoy sun-filtered common areas with cozy work booths, concentration rooms, and spacious desks shared by numerous workers. The number of desks required is virtually cut in half via hot desking — the concept of rotating employees’ workspaces rather than assigning designated desks. Both the roof and south-facing wall are covered in solar panels which convert sunlight into all of The Edge’s required energy. When the sun goes down, WiFi-enabled LED lights dim and brighten automatically via fully customizable sensor settings. No matter what time of day (or night), The Edge has space and lighting covered. 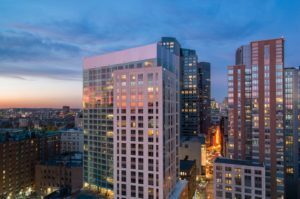 In Boston, Massachusetts, efficiency with environment in mind starts at home in The Kensington apartments. Similar to The Edge, The Kensington’s LED and CFL lighting fixtures rely on sensors to conserve energy. Amenities include free charging stations for electric-powered vehicles and energy-efficient heating and plumbing. The Kensington highly values minimizing waste. The paint and carpeting used in the building’s construction, as well as the trash bags, paper and cleaning supplies available, are sourced from recyclable materials. Tenants are also encouraged to use a specialized recycling system for paper, glass, metal, batteries and more. In the spirit of green living, The Kensington is a smoke-free facility. 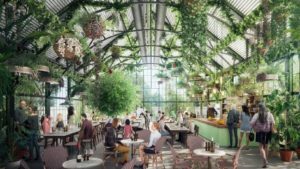 Melbourne, Australia’s Burwood Brickworks is more than a shopping center — it’s a living building. A living building is an eco-friendly structure posed with the challenge of being as green as possible. The living aspect of this shopping center’s architecture is nearly literal. Not only does Burwood Brickworks reuse and repurpose energy and water, it creates energy. The shopping center is said to create more energy than it uses on a daily basis. This enables complete self-sufficiency on an entirely new level. Burwood Brickworks even grows its own fruit and vegetables, turning this unique shopping center into a community. Dongtan, Shanghai is not an eco-friendly building. Instead, it is a planned eco-city where energy-efficient architecture will meet green urban planning. Like The Edge, The Kensington, and Burwood Brickworks, community is central to Dongtan’s goal. Only electric-powered vehicles will be allowed in the city. It is also proposed that the eco-city will be entirely self-sufficient in terms of water and energy. Unfortunately, the innovative city of Dongtan is still in the planning stage. Nevertheless, a city devoted to eliminating its own carbon footprint is an exciting idea to look forward to!